I'm often asked what scent I am wearing as it's a rather unusual one that's not as easily recognisable and stored on noses' hard disk as the better know perfumes out there like L'Eau D'Issey or Fahrenheit. 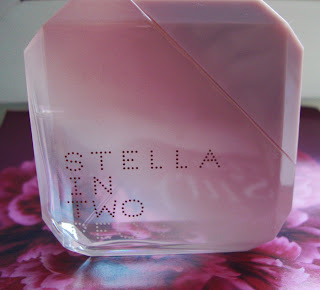 My favourite "eau" is Stella McCartney's "Stella in Two: Peony". The other part of the "two" is a solid perfume, amber, which I have never tried. Peonies are among my favourite flowers, too. Colors by Benetton. My first ever perfume and a rather individualist choice as my teenage peers tended to favour Lou Lou or Anais Anais by Cacharel. Calvin Klein's Obsession. I tired quickly of that scent and it now almost makes me throw up whenever I smell it. Similarly, I can't stand Amarige by Chivenchy any more, which in retrospect I probably only bought because it seemed a very grown-up choice. Other Calvin Klein scents I liked were Eternity which I used for quite a while, and Contradiction. Moschino's Cheap&Chic (I loved the bottle more than the contents). The same holds true for Burberry Brit. In summer, I occasionally used Jil Sander's Sun. Other eau de toilettes which I soon hated on myself but still find o.k. on others are Elisabeth Arden's Sunflowers and Green Tea. My Gucci phase included Envy (puke!) and Gucci Rush II (still nice). I really loved (and probably still would but it has been discontinued) Van Cleef&Arpels Automne of their "Les Saisons..." series. At duty-free shops I still occasionally take an "Italian shower" with Bulgari's Eau Parfumée au thé blanc. Stella was predecessed by Jo Malone whose Lime Basil and Mandarin Cologne and Pomegranate Noir I actually still really like and occasionally use. I'm sure I've forgotten some, but the list is longer than I thought anyway. PS: I remembered another one - White Musk by the Body Shop. Still nice.